Spokesmen for the US military would appear to have brazenly lied to the press about what actually happened in Baghdad on July 12, 2007. A full uncut version of the video intended for research purposes is available here. Prior to the release of this video, WikiLeaks was subjected to surveillance by US intelligence services. In addition, a classified Pentagon report urged that WikiLeaks be destroyed. Background here. UPDATE I: Presently the view count for the video shows "359" views. Based on the volume of comments, there is no possibility that YouTube is is accurately displaying the number of views this video has been getting. Videos with low view counts do not get highlighted on YouTube's home page. UPDATE II: It would appear that the only major international news organizations reporting on the video so far are the BBC, Guardian, Al Jazeera, and Russia Today. Interesting that apart from a few blogs, the mainstream American news media apparently does not consider the release of the video newsworthy. But Julian Assange, the editor of WikiLeaks.org, said there is strong evidence to suggest that the video is genuine. "There was a Washington Post reporter who was with that US military unit on the ground on that day," Assange told Al Jazeera, referring to David Finkel, a journalist who was embedded with the US military in July 2007. "He wrote a chapter in a book, which was published last year, called The Good Soldiers, which correlates directly to the material in that video. "Also, Reuters conducted a number of investigations and interviewed two ground witnesses at the time. "That story wasn't really taken seriously, [with] nothing to back up the witnesses, but now we have the video that shows that those witnesses were correct." I do not believe that any lingering doubts about the video's authenticity could fully explain the US media's neglect of this breaking news story. If the video implicated the Russian or Chinese military, I strongly suspect citizens of these countries would likewise be dependent on blogs for information about the appearance of such a video. Sadly, even under the Obama Administration, the mainstream American media continues to behave as if it takes cues as to what constitutes "news" from the government. UPDATE III: AP is now reporting that an unnamed "senior Pentagon source" has confirmed the video is genuine. WASHINGTON - A senior U.S. military official has confirmed as authentic a gritty war video circulating on the Internet that shows U.S. forces firing repeatedly on a group of men — some of whom were unarmed — as they walk down a Baghdad street. 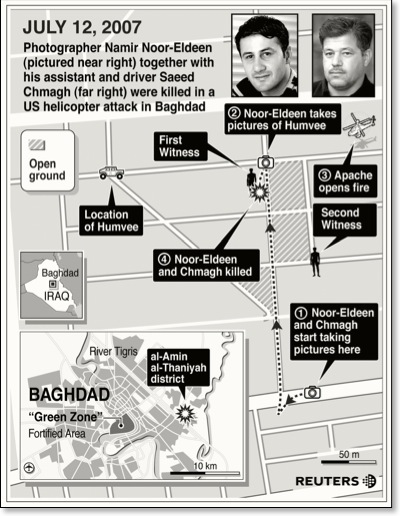 The official confirmed that the video posted Monday at Wikileaks.org was of a July 12, 2007, firefight in the New Baghdad District of eastern Baghdad. The official spoke on condition of anonymity because the video and a Pentagon investigation have never been released. "Firefight" -- hardly the word to describe it. The phrase used to introduce the heart of the story, "a ... video circulating the internet," attests to my observation that the video had not previously been deemed worthy of serious news coverage by the US press. But now that an unnamed senior Pentagon figure has verified the video, AP has chosen to inform Americans about its existence. Now the video is newsworthy. Before, it was just another video "circulating the Internet." Could the lesson here be that until a high-level Pentagon official has verified it, an independently verified video documenting the military's activities is not considered news? UPDATE IV: It would appear so. Now that a senior Pentagon source has validated the video, in the last 50 minutes -- many hours after major foreign news services ran this story -- Washington Post, Fox News, and the rest of the official state mainstream news media are reporting on the video. UPDATE V: CNN's Wolf Blitzer interviewed Pentagon correspondent Barbara Starr about the video. The network presented a short clip from the video. Out of "respect for the families of the journalists killed" CNN does not show the Apache helicopter actually firing on the group of men. What is really bizarre is that this CNN report makes no mention at all of the unconscionable attack on the rescue van which killed the rescuers and seriously injured two children. UPDATE VI: WikiLeak correspondents visited Baghdad and interviewed the children injured during the attack. More pics from their investigation here. "I can't pretend to know the full truth or circumstances of this. But at face value it is the most damaging documentation of abuse since the Abu Ghraib prison-torture photos. As you watch, imagine the reaction in the US if the people on the ground had been Americans and the people on the machine guns had been Iraqi, Russian, Chinese, or any other nationality. As with Abu Ghraib, and again assuming this is what it seems to be, the temptation will be to blame the operations-level people who were, in this case, chuckling as they mowed people down. That's not where the real responsibility lies." In summary, this was the inevitable outcome of decisions made at a very high level concerning the ROEs [Rules of Engagement], the attitudes purposefully inculcated in front line troops, and the performance expectations demanded of them by line officers. What is unfortunate, is that it takes WikiLeaks to make this apparent where we should be able to expect our military of policing itself and taking whatever steps are necessary to reduce friendly fire casualties without degrading force protection for our troops on the ground. .... the Pentagon yesterday -- once the video was released -- suddenly embraced the wisdom of transparency by posting online the reports of the so-called "investigations" it undertook into this incident (as a result of pressure from Reuters). Those formal investigations not only found that every action taken by those soldiers was completely justified -- including the firing on the unarmed civilian rescuers -- but also found that there's no need for any remedial steps to be taken to prevent future re-occurence. What we see on that video is what the U.S. does on a constant and regular basis in these countries, and it's what we've been doing for years. It's obviously consistent with our policies and practices for how we fight in these countries, which is exactly what those investigative reports concluded. There will be lot of those "real questions" to consider, from rules of engagement to the apparent cover up of the footage. But the threshold point I meant to start with is this: The very high likelihood of such "tragedies" occurring is a very strong reason not to get into wars of this sort. We could not know that this episode would occur. But we could be sure that something like it would. It's not even a matter of "To will the end is to will the means." Rather the point is: You enter these circumstances, sooner or later you get these results. A failure of tragic imagination is what I most criticized in war supporters in the months leading up to the invasion of Iraq, and it was much of the reason I opposed the war. We can't do anything about that decision now. But this new footage is worth bearing in mind as we face the next decision -- about bombing Iran, let's say; or extending the anti-Taliban fight into Pakistan; or how long to remain in Afghanistan. The most disturbing Video i have ever seen!! I am very upset about this and these murderers need to be prosecuted for this!!! It's ironic that you link the shorter edited video, after bashing CNN for showing an edited clip. I'm afraid you missed it. Above, look under the first video and video summary. There you will see where I linked to the full unedited version of the video.